Not only do they speak Spanish in Cuba, but we quickly discovered that they also speak baseball. Now, we are not baseball fans by any means, and my husband—being French—is totally befuddled by the sport! Nevertheless, we had just come from Florida, where we spent three years working and the boys attended school. As part of their full childhood immersion in the American experience, we felt that they should take part in varied activities as the occasion would arise. Consequently they participated in after-school Little League in Florida. Neither Sean nor Brendan became enamored with the sport, but at least they learned what it was and as it turned out, their brief baseball experience served them well as passports in breaking the ice and opening friendships with children in several Cuban villages. We had finally left our “lobster paradise” at the Casa de Pesca in Ensenada El Cajon on the western tip of the island of Cuba, and now were sailing on the “underside” southern coast of the island to the small fishing village of Cortez. This was our first experience of going against the tide, so to speak, in that we battled the trade winds head on, and it wasn’t pleasant. This short distance sail took us longer than we expected due to choppy seas and a counter current. Cortez seemed to be an accidental town by virtue of its location on a convenient bay that was a natural spot for fisherman to launch their small vessels. There wasn’t much to the town other than a short dirt-trodden main street, a few very small simple primitive houses and stalls, and all relatively clean. 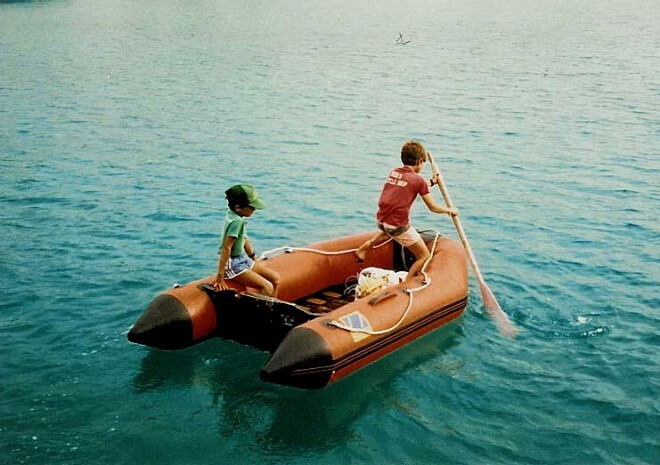 Michel, as was his custom, was the first to scope out the area, setting off to shore in the dinghy. This time he took Brendan with him, who was 6 years old at that time. They became quite the attraction when they landed on the beach. Every child in the village, it seemed, crowded around, plying them non-stop questions, and hovering around them as they tried to move up the beach and see the lay of the land. Michel kept this first visit brief, returned to the boat, and then headed back again later with both Sean and Brendan, as well as their baseball bat and ball. Any hesitancy by anyone at that point that may have existed on either side of the language barrier instantly melted away. We had brought along a fluorescent orange, sparkly aluminum baseball bat with us on the boat when we left Florida. The Cuban children had never seen such a beauty and they were in awe. They peppered our boys with a million questions: Where do you come from, where did such a pretty bat come from, do you go to school and how, what do your t-shirts say...? It was a rare sight for them, we think, to encounter sailors, let alone a family with young children. They were genuinely friendly and took Sean and Brendan under their wing, quickly whisking them off to the village’s makeshift baseball diamond. The next day, Brendan and Sean were anxious to return to shore, and the children were waiting on the beach. We all went on shore this time, and I felt like we were the Pied Piper. The whole little crowd followed us around constantly asking questions. They were very polite, keenly interested and curious, not at all indifferent to these new “intruders” among them. This time around, Sean and Brendan now knew the routine, and they scampered off with the crowd of kids to the ball field. An older teenage boy took a particular shine to Brendan, giving him pointers on how to properly hold the bat, along with tips for swinging and aiming at the ball. Since we could see they were in good hands, and there was no danger, Michel and I wandered off a bit to explore the main street. A man stopped at our encounter and proudly said in French, “bonjour,” introducing himself as Manuel. That was the extent of his French, he said, but he was eager to introduce us to his family. He had come from Havana for the weekend to visit his parents with his wife and daughter. We were graciously received in a tiny home, down a narrow dirt side path, and Manuel delighted in answering our many questions about Cuba and volunteering much information. He was a foreman of a construction team building a hotel for which “Fidel had much confidence in me” and he proudly showed us an 8" x 10" glossy photograph of him and Fidel Castro on the construction site. Manuel and his family were very curious as to what we thought of Cuba and why our governments were so antagonistic to each other. As with other Cubans with whom we had such discussions, Manuel extolled the virtues of his country, their society, and Castro. At this time in the late 1980s it was already quite obvious that Castro was embarking on an aggressive campaign to lure tourists and expand Cuba’s tourism economy. Quite a few Canadians and Russians were visiting the island at the time we were there, and several hotels and tourist resorts were already up and running with more in the planning stages. A few “Diplomercados,” or shopping centers or stores were open exclusively to foreign tourists where only purchases could be made with U.S. dollars. Manuel’s current job was further evidence of this new emerging trend. After the baseball game, the day finished with us buying all the kids ice cream at the village’s ice cream shop (which was pretty amazing in itself that this shop existed!). We still had so many of our Cuban pesos thanks to our original black market exchange for $100 back in Havana, that Michel decided this would be a good use for some of them. In true Cuban fashion, you could only buy what was available—no choice. So it was decided, a vanilla ice cream cone for everyone, and it only cost a total of pennies! Along with the wholesome outside activity of baseball, the children of Cortez also reminded us of an earlier time when toys were simpler, bringing much joy and fun to children without the modern marvels of Lego, Gameboy and the like. One of kids was playing with a classic old-fashioned homemade top, carved from wax—the kind with string wrapped around the top, that gets thrown to the ground, spinning around and around. I had certainly remembered those from my childhood, but Sean and Brendan had never seen one and they were pretty enthralled. They wanted to learn the spinning technique and the session finished with the top given to them as a gift. These kids didn’t have much to begin with, and they gave away one of their precious items. We still have that top today, part of our travel mementos, and a reminder of the kind heartedness of these children. We certainly didn’t intend to stay long in Cortez, but we could clearly see the boys were enjoying themselves, and getting a lot out of the experience—not only for the activity, but for the cultural exchange as well, so we prolonged our stay for their benefit. Brendan’s normal reserve melted away while he was here. He was anxious to go on shore immediately, and on one occasion he did go without Sean, and thoroughly enjoyed himself. Ah, indeed, you have to love the language of baseball diplomacy!